Even for drivers who have been on the road for years, the winter weather presents dangers every year with the snow, ice, and wind that it brings. These conditions make motor vehicle accidents a very real possibility. 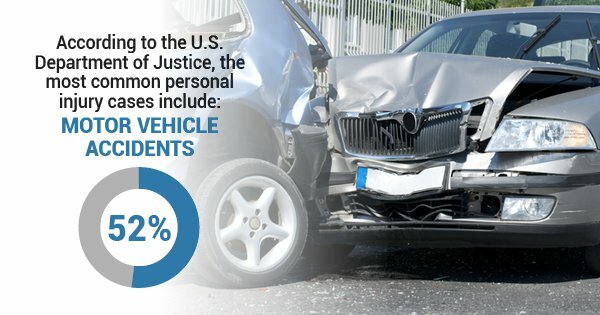 These accidents already make up 52% of personal injury cases, according to the U.S. Department of Justice, and bad weather makes them all the more likely to happen. Use these tips to drive safely this winter, and you can avoid a call to your car accident attorney. While braking is a completely normal driving procedure in standard weather conditions, it becomes very tricky when snow and ice are covering the road. Make sure that you are far enough behind the car in front of you so that you can come to a slow stop. Braking quickly on snow or ice can spin your car out and cause a major accident, as it typically takes 10 times the usual distance when you're stopping in the snow. Keep an eye out for black ice as well, as that will be nearly impossible to brake on even with plenty of distance. Your car will handle differently, depending on if it is a front-wheel drive, rear-wheel drive, or all-wheel drive. Most passenger vehicles are front-wheel drives, which will give you better traction and lower your chances of spinning out. All-wheel drive and four-wheel drive are the best for driving in the snow, as they are made for all different type of terrain. By knowing your drive type, you'll better know what to expect when you're driving and how to avert car accidents. Before there's a chance of snow falling, you should take your car to the shop to make sure the treads are up to par. The tires on your car are perhaps the most important part of it is being able to stop in snow and ice. If your tires aren't in good condition, then you run the risk of getting into an accident and making a call to your car accident attorney. In general, you want to be prepared for anything while you're driving in the winter. Take cautions that you might not normally in warmer months and make sure that you have an emergency kit in your trunk just in case you need it.